Thanksgiving dinner in Los Cabos! Thanksgiving is almost upon us, and here at Linens, Things and More we are feeling very thankful for the people we work with all year round who make our jobs and our lives more meaningful. From the villa rental companies to the hotels and wedding/event planners, we want to say thank you to all for the hard work you put in each day, and especially during holiday weeks such as this one. 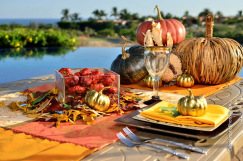 With many American guests in town for the Thanksgiving holiday, we are busy this week hosting events and dinner parties at several of the private villas. 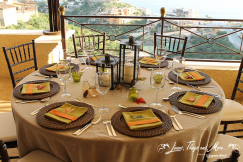 Over the past few months, the trend of planning private designer dinner parties has really taken off in the U.S., and we are pleased to see that trend catching on here in Cabo. It really makes sense for guests who are spending the week here and want to enjoy an extra special evening with unique linens, fine cutlery and distinctive stemware. We offer several packages in traditional holiday colors to suit your dinner party needs, with prices starting at $265 USD for eight guests. If you want something different and unique for your exclusive party, we can do décor in a variety of colors—in fact, we have a client this Thursday who is hosting her Thanksgiving gathering with furnishings in a deep shade of purple with silver accents. There are no rules, and with our sense of fashion and design, there are no limits! 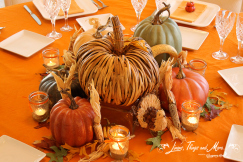 Whatever you decide to do for your holiday dinner, we wish you a happy and prosperous Thanksgiving holiday from the entire team here at the Suzanne Morel companies. Theme: Freeware | By Linensthingsandmore.